I here by kindly request your partnership in a water project for the Baraka Technical College and a volunteer who will teach motor mechanic. We are located in the Yatta district of Kenya. This is a youth center involved in youth empowerment by training practical skills to those who never continue with formal education and are over 14 years of age with 240 youth, both boys and girls. We are a non-profit making Christian organization in the Yatta district, a very dry prone area with limited agricultural potential. 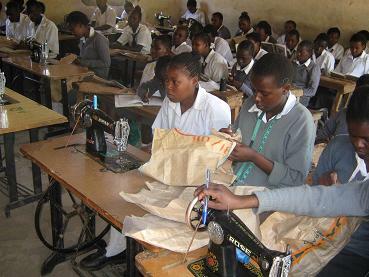 Baraka Technical College is currently taking care of 60 young children by provision for their basic needs that are from poor families and due to poverty situation could not afford to provide for their basic needs through a pastoral programme called care and support the needy. Baraka means blessings in Swahili language. This project is currently facing a great challenge of scarcity of water. The students get the water from 5 kilometers away, from the center. We are currently digging a shallow well dug by hand which is now 43 feet and the water is not yet reached. We have been trying any means we can to get water for this youth center, but so far in vain. This project being a wing of evangelism to the community has been a turning point of many children's lives. Through kind donations and internal funds rising we have made some children to finish secondary education and they are now enjoying the good work of the church as they give thanks to God. The majority of their parent were eliminated by HIV/AIDS, leaving them behind with very old and irresponsible grand parents who are mostly disadvantaged within the community. This programme provides for their basic needs like food, cloths, medication and education through pastoral home based care. You really make it seem so easy along with your presentation.